Last year I wrote out a list of forty things I'd like to do before I turn forty. The big date is coming up in May, and I've still got quite a few items left unchecked, but completing item #34 -- add 10 or more new songs to my running playlist -- turned out to be a breeze. Thanks to Alfie's subscription to Rolling Stone magazine, to Glee and to The Pea's newfound interest in pop music, I'm discovering great new songs all the time. 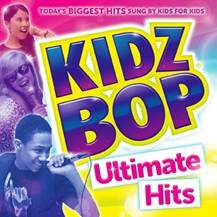 On May 8, KIDZ BOP is releasing their Ultimate Hits collection cd, and they sent me an advance copy to review. Needless to say, my kids love it; they don't call it Ultimate Hits for nothing! What's more surprising is that I do, too. I love all the songs, and remarkably, I didn't find any of the vocals annoying. The songs sound like good covers of the originals, not like a recording of your neighbor's high-pitched child singing at a recital or block party. I would definitely listen to these songs again-- see, my running playlist is growing and growing! Disclosure: I received an advanced copy of the cd to facilitate my review, but have not been paid to review the product or give my opinions. Product information is provided by the featured company/product and is indicated in italics. The views and opinions expressed here are my own.